I really like Corel VideoStudio Pro for video editing, and I’ve been using it for 4 years now. Unfortunately it really falls down when it comes to QuickTime videos. Now that I own a Canon 7D that records in QuickTime format, this is a problem. The underlying issue is that the software seems to lose all knowledge of its QuickTime capabilities when QuickTime has been upgraded on the machine. Since I use iTunes on this computer for my iPhone and iPad, there’s no possibility for me to downgrade QuickTime for VideoStudio. So tonight I set out to find a solution. I purchased QuickTime Pro ($30) and found that I could take a .mov file and perform a Pass Through MP4 conversion which essentially just strips the embedded mp4 data from the .mov file without doing any real transcoding. This is exactly what I want – I don’t want to lose any video quality just because I want the raw mp4. The problem now is that this is a completely manual process that I would need to do on each and every video file. File -> Export -> MPEG-4 -> Pass Through -> blah blah. There’s just no way that was going to work, so I decided to write some code against the QuickTime COM api to automate the process. // get the player, and the "control"
// have to wait for QT to open up. After building this, I added a shortcut to my Windows 7 SendTo folder. Now, in my video folder I’m able to multi-select as many .mov files as necessary, righ-click and select Send To -> QTExtractor. An .mp4 file will be created for each .mov! 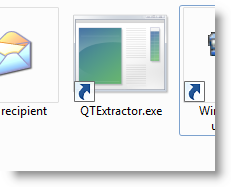 The only downside is that the QT UI pops up as it is working – I haven’t looked but I suspect I can’t get around this. Oh well, this should suffice until Corel gets their act together.